Kimberly Marshall introducing an item in her lunchtime concert on the Wetheringsett organ at St Swithun Worcester on Friday June 16th. It was a captivating programme of mostly secular music from the 16th century brilliantly played. 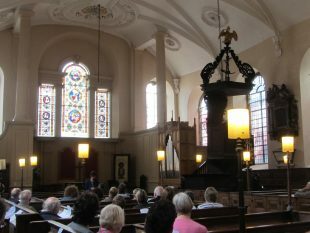 In the afternoon she conducted a multiple masterclass for participants from the Royal College of Organists with her usual enthusiasm and energy.